Request your 30-day commitment free evaluation of Atlas Today! Atlas delivers performance optimized data extraction from SAP, operating continuously without impacting SAP transaction processing. Atlas also provides options for data warehousing, reporting and analytics, for any SAP modules. Atlas leverages a proprietary Highly Optimized Performance Extraction (HOPE) process, which addresses enterprise SAP system performance holistically. Using mathematical modeling based on operations research queueing theory, Atlas optimizes and balances the available system resources to avoid impacting the source SAP ERP systems, while data extraction is taking place. Atlas delivers a complete data analytics and BI solution for your organization, right out of the box. 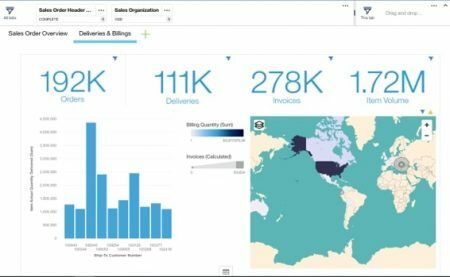 Optional out of the box data analytics and BI solution, right on top of your data. The SD component manages major processes of sales and distribution, including selling products or services in national and international markets through direct sales to customers or through distribution networks. The MM component manages procurement and inventory. The FI component records a company’s financial transactions, including transactions of its customers and vendors. Download Atlas Data Analytics for SAP Brochure now!